Following years of what could generously be called “under-achievement” and more brutally termed a “systemic malaise”, it is no secret that this is a crunch season for Edinburgh Rugby as they pin their hopes on new coach Richard Cockerill righting the ship. 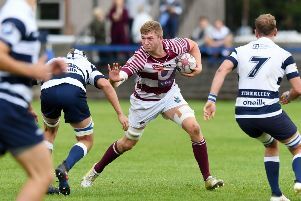 Within the wider project it is shaping up to be a vital season for certain individuals too, including stand-off Duncan Weir, as he looks to push for a return to the Test team. Now 26 and with 27 cas to his name, Weir has endured a testing year after his move to Edinburgh from Glasgow in a bid to let him shine out of the shadow of Finn Russell, who had eclipsed him as the nation’s undisputed No.1 playmaker. A broken jaw was the worst possible start to his time at the Capital club and there were difficult periods later in the season when he was dropped from the starting line-up. Weir is now looking forward to a fresh start in the upcoming campaign, which starts at Cardiff on Friday night, hoping to get a good run in the No.10 jersey and disprove the doubters who feel he perhaps lacks the attacking dimensions required to be a really top stand-off. In fairness to Weir, it was something he was clearly working on during the latter part of his time at his hometown club, with an evident shift in style, and that is something he is hoping to continue and develop. “I probably let others play outside me a bit too often in the past,” he admitted. “It’s now a focus for me that if I see a gap I’ll try my best to take it and get the attack over the gain line. Weir said it wasn’t a case of Cockerill giving him licence to throw more caution to the wind. Cockerill has started Weir in both the pre-season games against Sale and the Falcons, which suggests he will get the nod again in Cardiff. However, his Welsh rival for the No 10 jersey, Jason Tovey, made an impact when he came on at the Greenyards and the Scotland man knows he has a battle to nail that Edinburgh spot before turning his thoughts to the dark blue. “I’m just looking to play rugby and enjoy myself,” said Weir. “Richard has given me confidence by starting me in two pre-season games and he has spoken to me about what he expects of his 10 - making good decisions, knowing the play book off by heart and putting the team in the right areas. I feel I can do that.